In the past Tony Stark and Steve Rogers recruit Eden Fesi, Sunspot, Cannonball, Falcon, Wolverine, shang Chi, Spider Woman and Captain marvel. On Mars Ex Nihilo explains to Thor how him and Abyss were created by Aleph and how what he plans to do to earth is mercy considering Aleph would raze the entire planet and leave it a barren dead husk. On Earth Captain America and his freshly minted team assemble an aircraft to head to Mars. Earth meanwhile is bombarded by Origin Bombs resulting in loss of human life. Cap realizes they don’t have time to wait on the aircraft and has Manifold use his powers to bend space time to take them all to Mars. 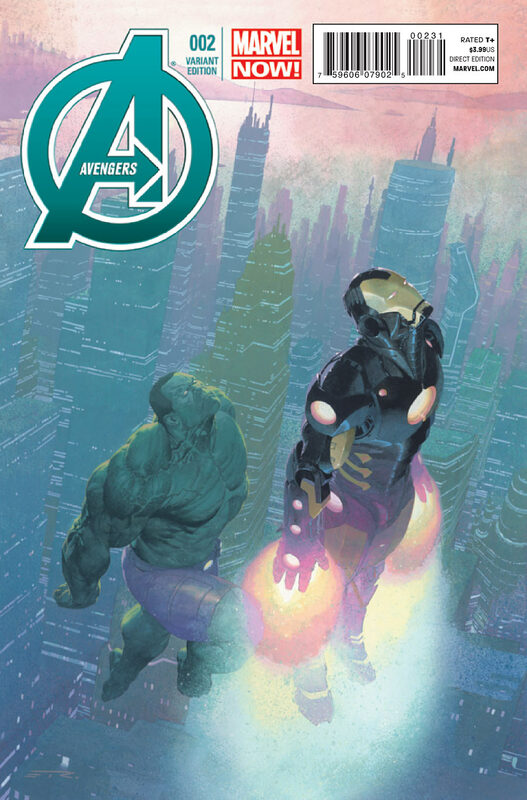 Cover- The standard cover which connects with last issue (Avengers (2013) #1) is pretty cool, with Falcon and Sunspot getting background time to the more popular Thor and Black Widow. Jonothan Hickman- Somebody slap me and call me sandy, my man crush meter has just hit max! Not since Joss Whedon (Buffy, Dollhouse, Angel, Cabin in the Woods, Firefly, Astonishing X-men, The Avengers [Movie]) and Grant Morrison (JLA, New X-men, Batman & Robin) have I had such a serious love for a writer. This book is enchanting in a great many ways. Art- If Jerome Opena continues to do what he’s doing here on this book I will be forced to rethink my top ten comic book artists list. This is simply stunning work from start to finish! 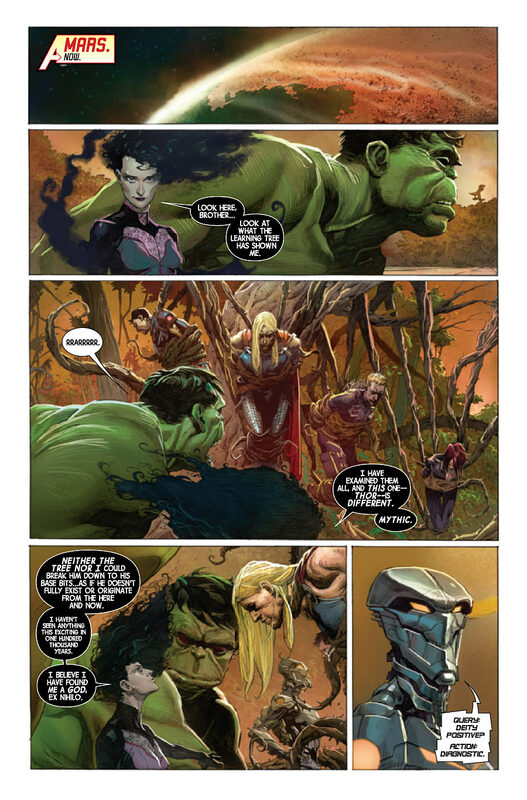 Humor- Also of note is how Hickman manages to sprinkle humor throughout this book. The scenes involving Wolverine, Falcon, Manifold, Sunspot and Cannonball in particular stood out in my mind. Black Heroes- How is Hickman selling this book to marvel? Or even the comics industry as a whole? What happened to having a single token black member of a team? Or let’s be more “progressive” and have two! Hickman upends the tea table (Do you get the Nintendo reference there?) and throws Sunspot, Eden Fesi/Manifold, Falcon and Captain Universe! I still can’t get over how much black is in this book, honestly! Kudos Mr. Hickman, Dwayne McDuffie would be proud. Recap pages- These Marvel Now recap pages fill my mind with images of those fold out recap and character biographies of 1997-1998 right around when Scott Lobell (Current writer of Teen Titans in DC’s New 52) departed from the X-men line (and marvel). 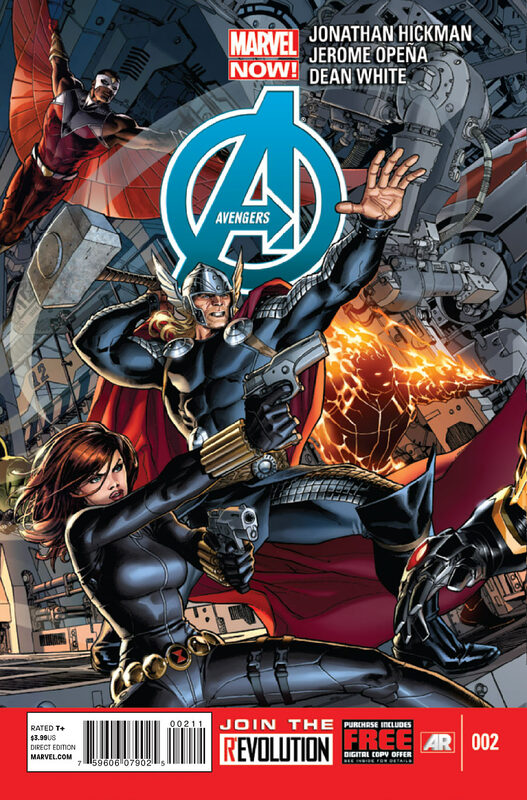 The second page is my favorite though; we see this global Avengers team represented by symbols surrounding the stylized Avengers “A”. Active members are represented in blue while those taken off the battlefield in this case captured represented in red. This simple way of bringing the reader up to speed makes this a very accessible tale with the added bonus of telling us which members will be getting the limelight in each issue. Villains- I’m enamored by Ex Nihilo, Abyss and Aleph. Here are three beings cast as villains based solely on perspective. Aleph is a machine ruled by logic and thus would destroy earth simply because of the threat level to the rest of the universe. I get that! 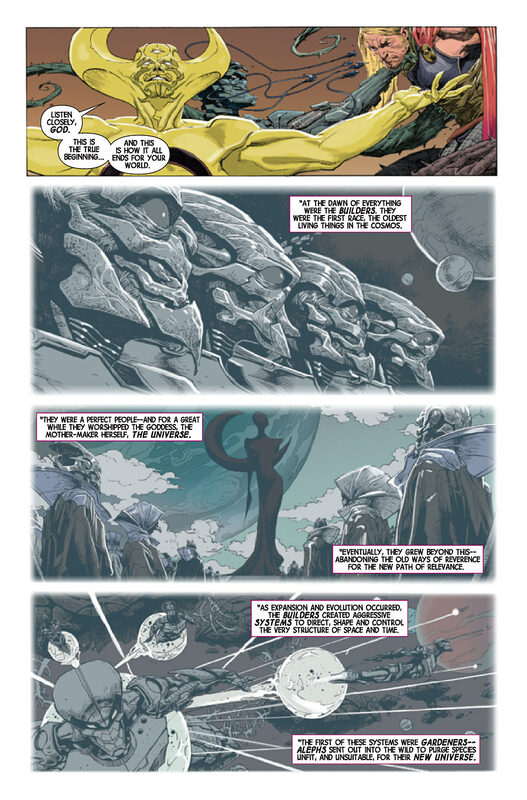 Earth survived multiple attacks by Galactus, spawned multiple Phoenix hosts and survived destruction, defeated a skrull invasion, a Phalanx Invasion, a kree invasion and a many other great things. As a race that has not reached the pinnacle of their evolution or even their technological advancements those are truly terrifying feats from a multiple galaxy perspective. Meanwhile Ex Nihilo and Abyss are trying to save the people of the planet by forcefully evolving them. Both lead to the destruction of earth but one leads to something far greater for the race found there. I can see and understand their perspective which makes them the most fleshed out villains of Marvel Now bar none! Hannibal Tabu (from Komplicated.com) must love these guys. I loved every panel, every frame and every detail! GOD! This is how comics should always be!